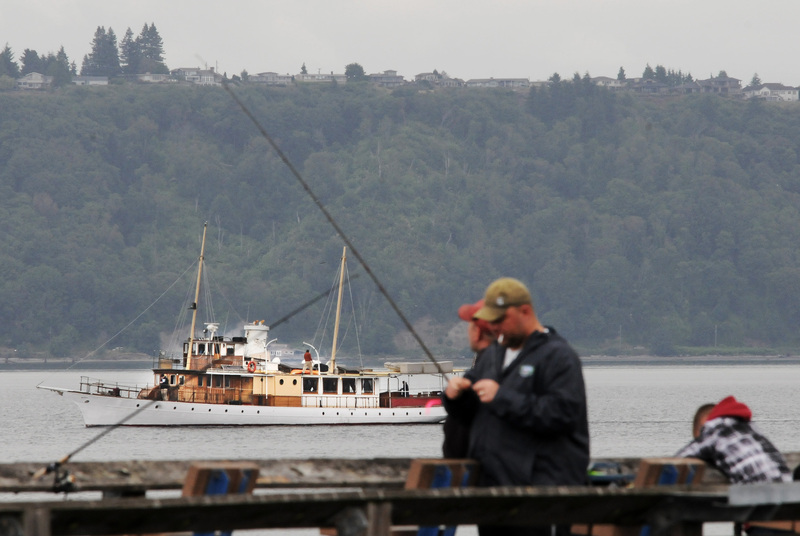 The 120-foot steel-hulled yacht El Primero, built in 1893 in San Francisco, Calif., cruises by a fishing pier along Ruston waterfront in Tacoma, Wash., Tuesday June 17, 2014. Several of Sidney Albert “Sam” Perkins’ great grandchildren were aboard for the pleasure cruise organized by a local group who wants to tun the old boat into a floating museum. An email exchange between Sea Magazine and Richard Hildahl regarding the El Primero. Sea Magazine is a monthly publication specifically for active boating enthusiasts from Alaska to Mexico. The magazine focuses on nearby cruising and fishing destinations and legislation that affects boaters in the western United States. Sea Magazine: How did your interest and involvement in El Primero begin? Hildahl: My interest in the El Primero began approximately four years ago. We live on Filucy Bay in Longbranch, Wash., on a portion of Faraway ‑- the historic 80-acre summer residence of one of the founders of the Bon Marche, a major regional department store founded in 1890. The store benefited greatly from the Alaska Gold Rush and the completion of the transcontinental railway to the region. The location for Faraway was chosen because of the wonderful harbor, beaches and great views of Mount Rainier, the Cascade and Olympic mountains. While researching the history of Faraway (which was built in 1915) we discovered that it was a popular destination for owners of private large yachts, El Primero being one of them. That started my journey that continues to this day. I am still documenting the incredible history of this special yacht and working diligently to preserve her legacy. Sea magazine: What is your hope, going forward, for the future of the El Primero? I am working with a number of people to preserve the yacht and its history for future generations. Our vision is to establish a foundation to maintain, refurbish and preserve the El Primero as a floating museum. The home port of this historic yacht will be on the Foss Waterway in Tacoma, but the vessel would travel the Puget Sound for special events, such as recreations of her past voyages and appearances and museum exhibitions at dock. The feasibility study for establishing the foundation has begun and will include an out of water survey, inspection and refurbishment. The goal in the short term is to get this historic yacht ready for the 2015 boating season in the Pacific Northwest. Hopefully we can show off an exceptional example of the South Sound’s maritime history in time for the 2015 U.S. Open at Chambers Bay Golf Course. Those wishing to support this effort can give a donation to the El Primero Project Fund c/o the Tacoma Historical Society, P.O. Box 1865, Tacoma, Wa 98401.